One of my favorite things about going to an Italian restaurant is the bread they bring to the table to dip in the olive oil or you can get it with different toppings for an appetizer. The smell of it, the taste of it, the everything of it. We’ve had an abundance of herbs lately in our back yard and The Kid has been asking for bruschetta just about every night. Chop tomatoes, snip some fresh herbs out back, and she’s thrilled. I’ve been buying loaves of bread at the store to serve along with it, but I decided to make my own focaccia since it’s not hard to do. It doesn’t take long either to have fresh bread. You can have it on the table in about an hour with quick rising yeast. Most of that time is hands off too. You mix and leave it to rise, then you bake. It’s about 10 minutes of actual “work” and the rest is just leaving it to do its thing. Because I never do things by the book, I made individual focaccia rolls. They’re really cute in the single serving sizes, and you don’t have to spend time cutting a loaf. Just grab a roll, tear in half, and dip. They’re also great to make mini sandwiches or flatbreads later with the leftovers, and they freeze well if you somehow don’t eat them all. Measure the flour, yeast, half of the herbs, sugar and salt in a large bowl. Toss with a fork to quickly combine. Add the warm water and olive oil and stir into a dough. The dough will be wet and loose. Spray a muffin pan with non-stick spray. You want a total of 18 muffin cups so I used a 12 pan and a 6 pan. Divide the dough into 18 pieces and drop one piece into each prepared muffin cup. I used an ice cream scoop to just scoop the dough quickly into the pans. No mess on my hands either. Cover the dough with a damp towel to prevent them from drying out and put them in a warm place to rise for 30 minutes. Once the muffins have risen, preheat your oven to 375 degrees. Mix the remaining herbs with the garlic salt. 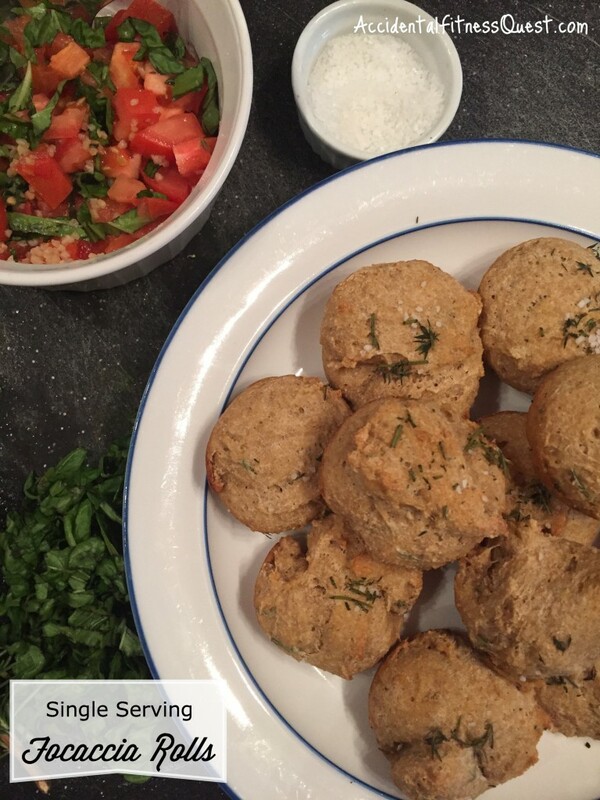 Lightly spray the tops of each muffin with non-stick spray and sprinkle each with the herb mixture. Bake at 375 degrees for 20-25 minutes until golden and crispy on the top. Remove from oven and serve with dipping oil or bruschetta topping. Makes 18 focaccia rolls at approximately 73 calories each – 2g protein, 14g carbs, 1g fat. If you like a more traditional focaccia bread, spread the dough into a greased 13×9 inch baking dish instead of the muffin cups. Bake at 375 degrees for 25-30 minutes. So just slightly longer. Play with your toppings here just like you would with any focaccia. Different herbs and toppings make them your own. If you give them a try, let me know what toppings you used in the comments below. I’m always looking for more ideas.